Volunteers help in many, many ways at the museum. Here is a list of how you may want to assist us in providing history education and preservation to our community. Prospective Junior Interpreter volunteers, who would like to participate in 2019, should email Holly at midwayjunior@gmail.com to schedule an appointment for Saturday, February 2nd or 23rd from 9 am to 12 pm. 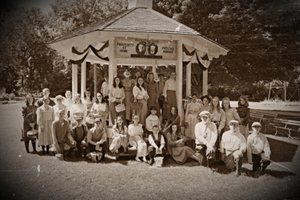 This unique program is geared for ages 10 – 18 and is an excellent opportunity to discover the past while helping in the present. 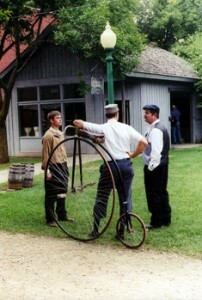 During special events, Junior Interpreters help bring the Victorian Village to life by costumed interaction as Village youth. Junior Interpreters will have opportunities to dress in Civil War era clothing during our Civil War Hands-On History School Days program in May, 1900 era clothing during our summer and fall special events and 1940’s era clothing for our World War II Days event in late September. Whether you’re interested in acting or history this is a great way to become involved. Please email Holly at midwayjunior@gmail.com to find our next meeting date. During first meetings, all juniors will fill out an application. Parents must attend this first meeting. There is also a fee for each applicant, which goes towards costuming and supplies. Volunteers are always needed to help with special projects such as data entry, sewing, preparing supplies, delivering posters, or assisting Marketing with surveys or manning information booths. Provide support at special events. Duties include greeting visitors, selling tickets, and assisting at the Front Desk during events. Help with landscaping, decorating the village, or help our Garden Historian maintain our beautiful gardens. Join us on Wednesday mornings for a brief meeting, followed by a morning work session in our Collections Dept, Textiles Department, or Workshop.